You may have known that CyanogenMod is a very popular Android ROM (actually the most popular Android ROM) but you probably didn't know that it's so popular that it's gotten some stage time of its own at Google I/O 2012! OK, for those who happen to be unaware of what CyanogenMod is (shame on you! ), it's a custom distribution of Android, free from all bloatware, optimized for better performance, enhanced with additional features and currently found on about 2.5 million Android devices. That should give you some perspective of what CyanogenMod is all about. Now, we really want to avoid any spoilers here of exactly what CyanogenMod's founder — Steve Kondik — and his crew have discussed with developers during Google I/O, which took place last week, so why don't you, Android aficionados, do yourself a favor and hit that Play button below? Just note that this is part 1 of the whole CyanogenMod conference, and part 2 isn't available yet, but this shouldn't be a problem, as this video alone is about an hour long. 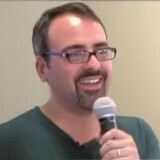 Coming up next on Android Hack TV: Why's CyanogenMod's mascot, Cid, ugly as hell? If you have any guesses, please post them below! Awesome modifications they do to the Platform!!!! Yes His Android Platform is good as i had problem before with WiFi and swiched with CGM no problem know,thanks.